The tallest Douglas-fir at Kerrisdale Elementary School, Vancouver. Humans have always been curious how tall are trees able to grow? I first pondered this question a long time ago at my elementary school, where I encountered a towering Douglas-fir looming over the school gym (see below). I was always curious how tall it was, or could get? Furthermore, I have noticed it growing taller and wider over the past 25 years so in July, 2014, I decided to go out and measure it for the first time. I measured the tree at 44.4 m (147 feet) by averaging three hypsometer estimates —its the tallest tree I’ve measured within Vancouver city limits after the giants of Stanley Park (63.6m) and Queen Elizabeth Park (49.5m). The tree is easy to locate just a few meters south of the basketball court (see map below). Other tall Douglas fir at the school. The school grounds at Kerrisdale Elementary evidently support productive Douglas-fir growth. Scattered around the 4ha school grounds there are at least eight trees taller than 37.5m, which you can see on a short walk. On the north side of the basketball court near 39th Ave, is a cluster of several tall trees up to 41m in height. A more impressive big tree grove is along the very southern edge of the school grounds (along 41st Ave). The thickest tree there is right beside the swing set and it is 41.2m tall and 131 cm diameter (seen below on the right). The Douglas-fir trees at Kerrisdale School and in the surrounding neighbourhoods are quite large given how young they are. These Douglas-fir are mere saplings, planted in the early 1900’s after the original forest was cleared. To put that in perspective: these trees already up to 44m tall may only be in the first 10% of their life history; Douglas-fir often live for more than a thousand years. So to shine some light onto the question of exactly how tall can a tree grow I’ll refer you to the epic natural history of superlative trees from the Vancouver area, which was once called ‘The Great Vancouver Forest.’ This epic has largely been forgotten and is off the minds of the residents living around it even though it was less than 130 years ago today. 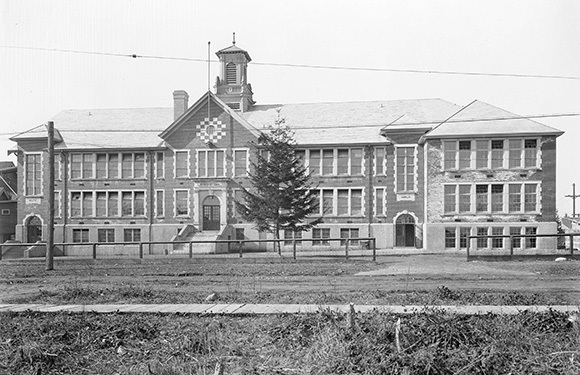 Kerrisdale school, built 1908, seen in 1925 without large trees around it. The small tree in the middle has about 16 branch whorls, indicating that it was planted around 1908, the year the school opened. The other tall Douglas-fir on the grounds were likely planted at the same time. Other evidence corroborates that exceptional trees once grew in this area, but urbanization has removed nearly all traces of the superlative trees including their legacy stumps. The story of this great forest is muddled and it’s inconclusive how tall the trees once grew. Historical accounts of tall Douglas-fir provide one method to estimate the historical height of trees. One major line of insight is the compilation of historical documents by Micah Ewers, which shows evidence of historically logged trees appearing to have been much larger than today’s remaining Douglas-fir. Micah has worked closely with big tree expert Dr. Al Carder in compiling these references. I recently spoke with Micah (Oct 2015), to get an update on his progress. He reports that among the documentary evidence collected, it’s clear that Douglas-fir 90 – 105m (300-350 feet) in height were common in southwest BC and Washington. We also now have good documentary evidence that Douglas-fir likely reached 105m – 120m (350-393 feet). 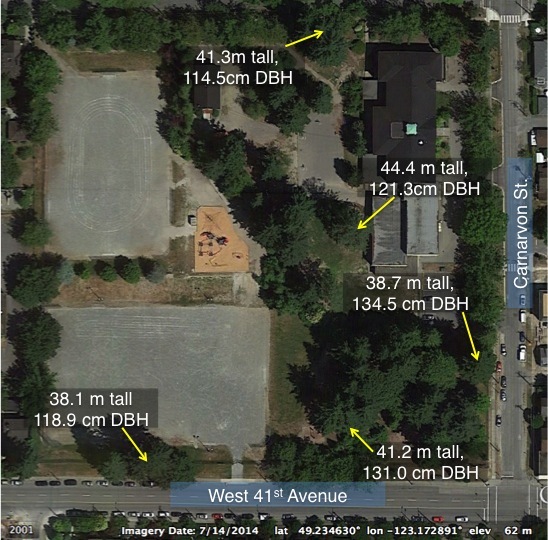 However, more documentary evidence is currently being searched to corroborate reports of trees that surpassed 400 feet, including records of trees in Kerrisdale. The most frequently backed record of a superlative tree may be the Mineral tree near Mineral, Washington. It was measured and documented several times as towering over 450 feet before it blew over in the early 1930’s. To put these historical accounts in perspective, the tallest Douglas-fir in the world today is the Doerner-fir (99m) in Coos County Oregon. I cycled to the Doerner fir in 2013 to see it for myself. 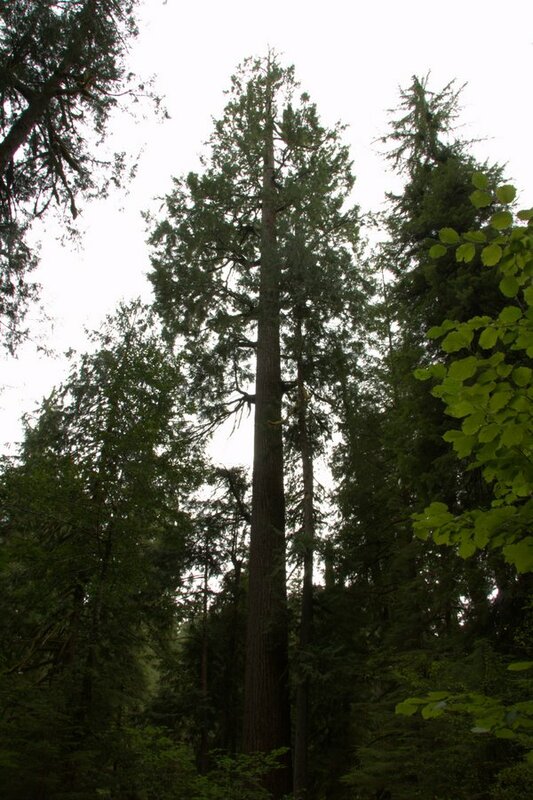 The tallest Douglas-fir in Metro Vancouver was the 94.3m tall (310 feet!) Meech Creek Giant in the Coquitlam Watershed (no public access), which has recently died but remains standing. 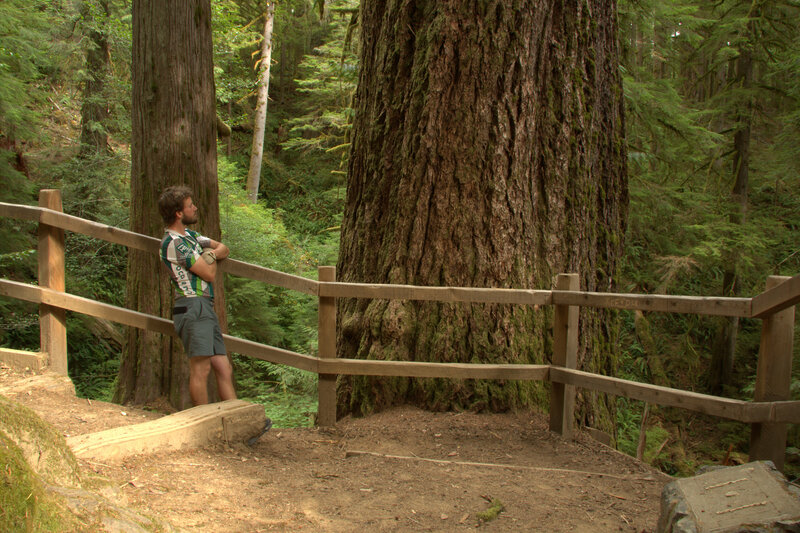 There are also several Douglas-fir in the Seymour Valley over 80m tall in the Temple of Time Grove of Giants. The Temple of Time grows along a thin fringe of rocky shallow soil wedged between the historic clear-cuts of the 1920’s and a vertical rock wall that was to steep for the loggers. In my impression, as a forest ecologist doing inventory of tall trees, these sites are unlikely to be the most productive sites given that they are on steep slopes at around 450m elevation, with rapidly draining soils. Instead, they are simply the areas that loggers never got to. Its clear to me that before the vast majority of the landscape was logged off, there were substantially taller trees than what we see now today. Only a fraction of the original temperate forest old-growth still remains in California, Oregon and Washington. In BC, there is slightly more, but it is continuously logged off. The largest trees, on the most productive sites were among the first to go. Old-growth logging continues along coastal BC today. In the absence of policy to identify and protect significant trees, we are likely to be still losing trees of the great age and monumental size as discussed in this blog article. For example, in 2014 the second largest Douglas-fir was discovered to be left behind in a clear-cut. Unfortunately, the tree will now be at high risk to be blown over in the coming decades as it not longer has a surrounding stand to buffer it from wind risk. Local big tree experts, forest ecologists, and members of the public has been campaigning for legislation to protect significant heritage trees for decades. Yet, to date no policy is in place to protect the provinces largest trees. An indefensible shortfall of the government is that neither have they done the research to inventory and manage our most significant trees, nor do they listen to public and environmental group input, which have identified numerous areas, often with the largest trees, as priorities for conservation. We may never know the actual height of the regions historical trees. Various lines of research, such as collections of documentary evidence, predictive canopy models, and tree physiology experiments, may one day improve our understanding. Or, maybe one day someone will discover an unknown giant (which is entirely possible). In the meantime, visits to the the tallest remaining trees in the Vancouver areas including in Stanley Park, Capilano Canyon, and most prominently in the Seymour Valley, provide opportunity for you to empirically calibrate your own sense of how tall the Douglas-fir can grow. Alternatively, visit a tall second-growth forest and be amazed that trees as young as 100 years old that are now recovering from logging can be nearly 60m tall yet only 100 years old. The tree at Kerrisdale School will likely never reach the size of trees seen in former days, but they seemed pretty big for me as five year old staring up at its thick fissured trunk. And they still do today. The tree was big enough to help peak my interest in forests at a young age. I encourage that any people who visit a tall Douglas-fir forest will have their minds opened to the tantalizing question of just how tall a tree can grow. Have any other references of historical trees that I should share? Please leave a comment below. Hi. I am very interested in locating a survivor tree in the Kerrisdale area that was growing before 1850 (precolonization). It occurs to me that the entire area does not have a single air breathing survivor from before that period. I found those trees fascinating when I attended. Once in a while, I go back and hide loonies in the bark. I grew up a block away from Kerrisdale Elementary and spent countless days in the late 80s and early 90s playing hide and seek, tobogganing down the hill, learning to ride a bicycle, etc on those grounds even though I was never a student there. I always loved those trees, and after a big wind storm it was interesting to see the big branches that had fallen. Great website, really enjoyed reading through a number of your posts! Thanks for the feedback and for sharing your story at the Kerrisdale School grounds, Chris!